Beginning this week, PR started off by taking several pictures for the Chairman’s Award and the badges that were designed this week. Since essays were due on Wednesday of this week, most of the work for the first couple of days was for the essays to get them ready to submit. After completing and submitting the essays, work continued to the weekly videos as well as the apparel PowerPoint. Brainstorming began for the Chairman’s video and some pictures and video was taken for that purpose. Work started on looking though scholarships for seniors and creating a document and spreadsheet in order to organize all of the scholarships to make it easier for our seniors to find and apply for those scholarships. 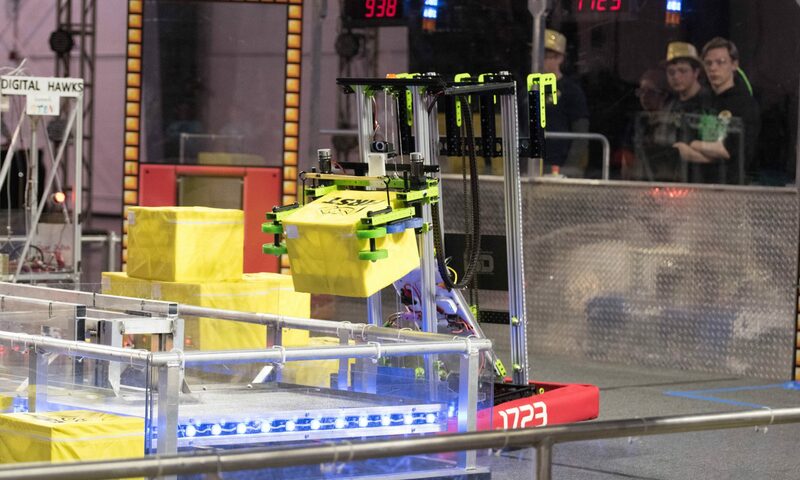 Continuing from the previous week, B/D continued to get everything built and attached to the competition robot, and more organization in the tool room (aka Dungeon). The frame work for the competition robot was also completed this week in addition to the battery bracket. As the week progressed, the gear hopper, the front piece, the claw for getting gears from the floor, and the climber cactus were all installed on the competition bot and all were tested. Most were successful, but the cactus broke when B/D tried to remove the rope from it, so that had to be replaced with something stronger. By the end of the week B/D finished building and assembling the gear chute, and it was finally able to be attached to the competition robot. The frame was made ready for the bumpers. Starting off the week Control attempted to get some practice driving with the robot, but strange things kept happening with communication. While a few people from Control attempted to figure this out, others continued to work with the robot and tested out the gyroscopes, and getting the robot to register gear switch and interface. After testing the robot, Control found that there was still more work that needed to be done with the raspberry pis and LEDs. Meanwhile work on the scouting app continued to allow us to scout out other teams more effectively. By the end of the week Control was able to start on the 2017 final code and get the gear sensors working.